The red wood trees rise up dwarfing all that pass under their enormous shadows. 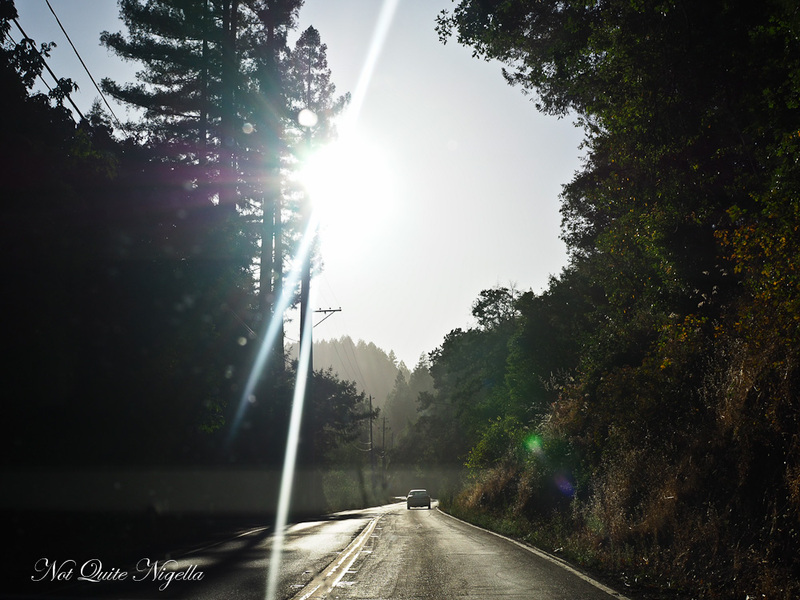 Guerneville, located in the Russian River Valley in Sonoma County attracts a wide range of visitors attracted by its natural beauty and free spirited ideas. 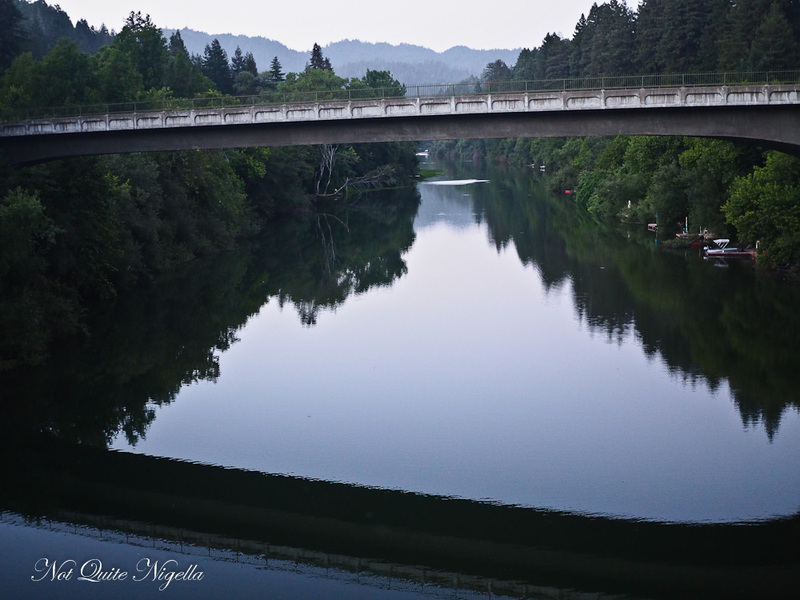 The Russian River runs through Guerneville, named after Ivan Kuskov of Russia who explored the river. It is particularly popular historically as a holiday destination with the LGBT community and the population of just over 4,000 also has a large Hispanic population. A man plays a banjo outside a bar, busking for money. 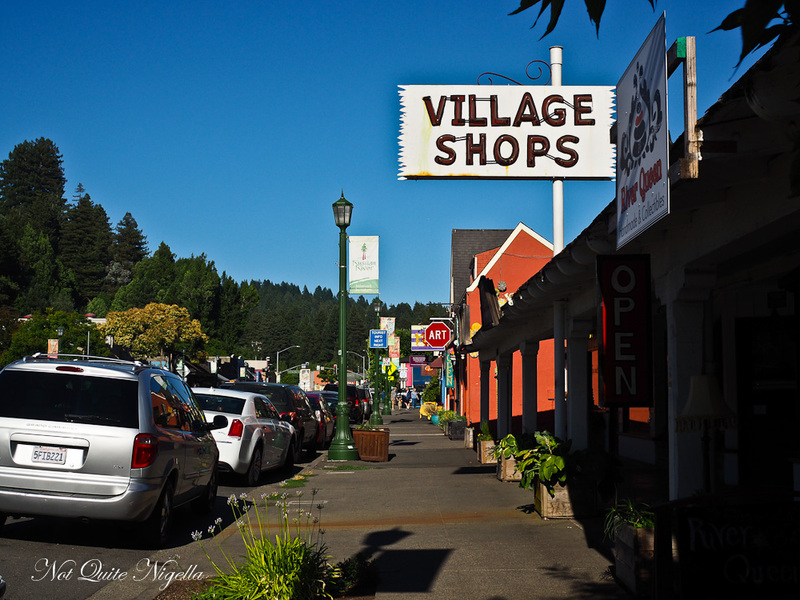 Occasionally couples stroll down the main street and if there's a word to describe the people in Guerneville it's eclectic. It's a town that gone through several transformations and one of them earned its nickname "Stumpville". 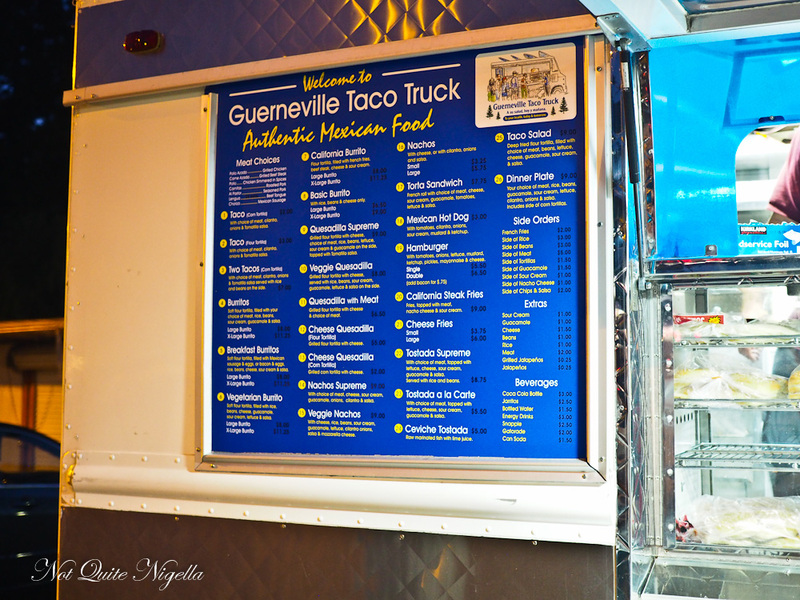 A steady presence in the town is the Guerneville Taco Food Truck. Located in the Safeway parking lot it is open from 11am to 9pm 7 days a week. As I'm looking at the menu the proprietor watches a man seated on a seat. "You hungry?" he asks him. The man nods and says yes eagerly. He offers a deal - tidy up the hoses and clear the bins and he'll get fed. It's a good deal, within a few minutes the man is holding a foil wrapped burrito. "Good evening senorita," the taco truck guy says smiling. He knows everyone by name and kids get fist bumps. I ask what is good. "Everything," he says not so much boastfully but after thinking about it for a second. 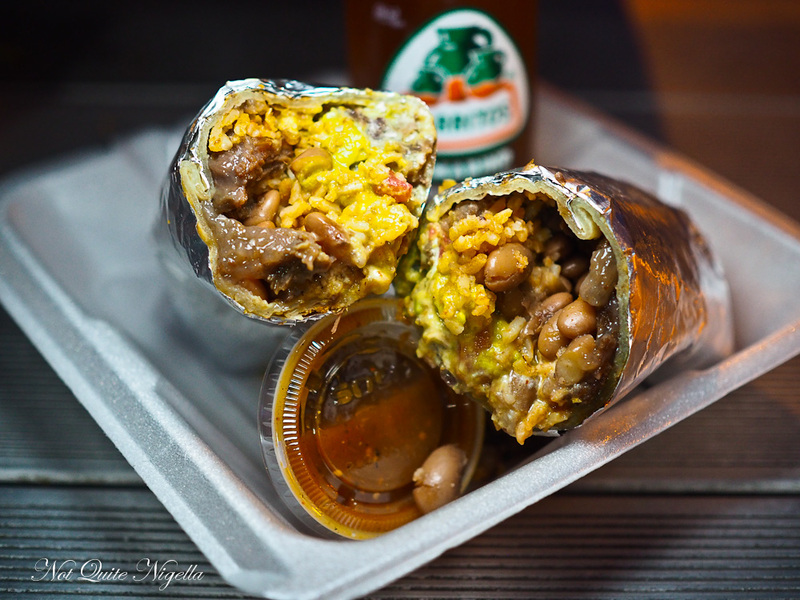 We decide on a cabeza burrito made with beef cheek (there are regular beef, chicken and pork). The lengua is not available. "And for your bodyguard?" he says to Mr NQN who laughs (I've lost count of the number of times Mr NQN has been called my bodyguard by people lol). We order him one steak and one pork carnitas tacos. He offers us medium chilli sauce but when we ask for hot he asks us if we want a roasted green chilli. The answer is a resounding yes and we sit back and eat our food with a bottle of tamarind Jarritos. The burritos are filled with soft beef cheek, rice, guacamole, tomato and sour cream and they hit the spot. 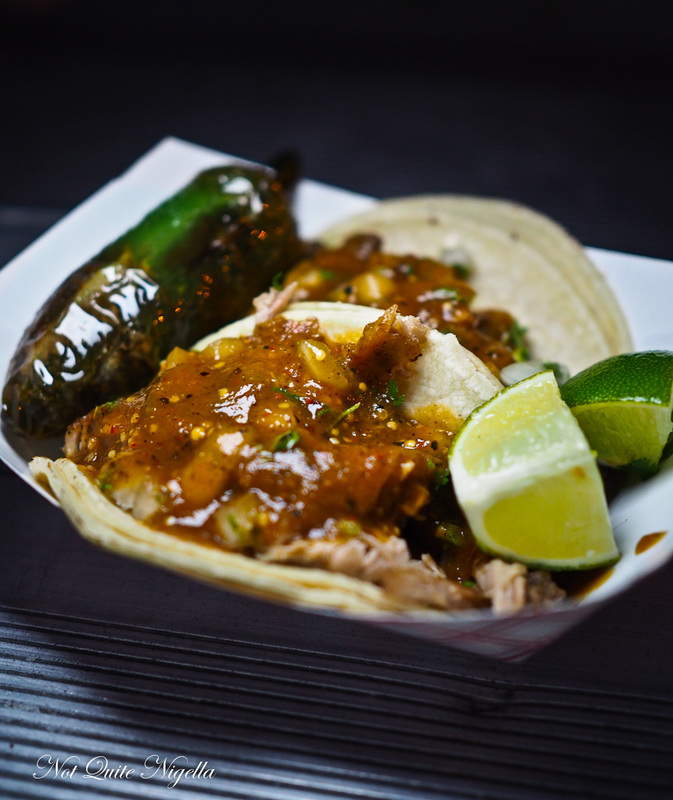 The tacos are also good especially when chased with a bite of super hot jalapeno pepper. We use the Jarritos to quench our thirst. We get up to leave and he asks us how our food was and we tell him that we really enjoyed it. We discuss Australia with him. "Hey they don't want us here anymore, maybe we can move to Australia!" he says. 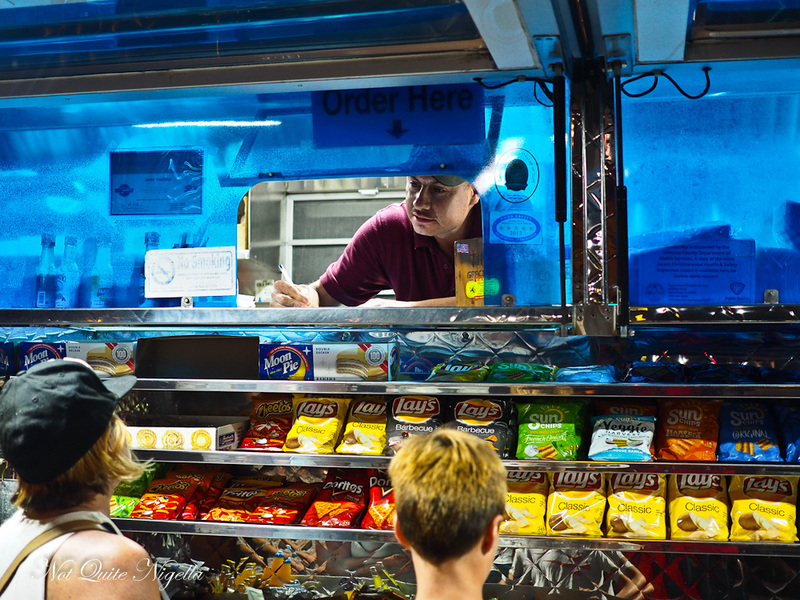 "I just need to find a way to bring this whole truck over," he says gesturing at the neon blue lit truck with a display full of iced drinks, chips and candy for people to pick and choose from. I tell him we'd love him in Australia and as we leave he says, "See you in Sydney!". 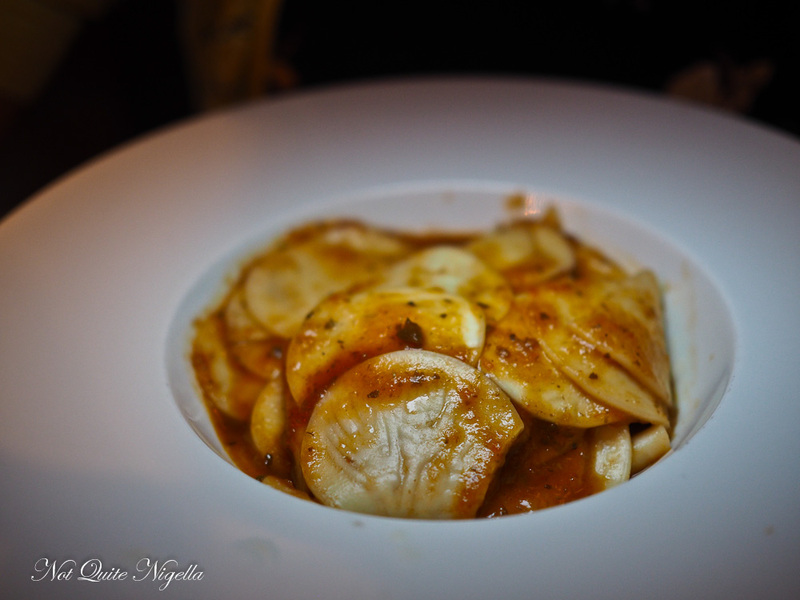 If you have a hankering for some pasta, Pinoli Italian restaurant is located at the Applewood Inn. It's seen as quite a romantic restaurant and sure enough there are plenty of couples inside. The proposition here is that there is no hostess or waiters but the chefs take your orders and bring the food to you. I'm not sure what happened that evening but the owner and chef Christian Darcoli spent most of the time in the kitchen and we had a waitress just like a regular restaurant (albeit a very rushed off her feet one) so maybe something has changed there or they had a staff shortage in the kitchen. 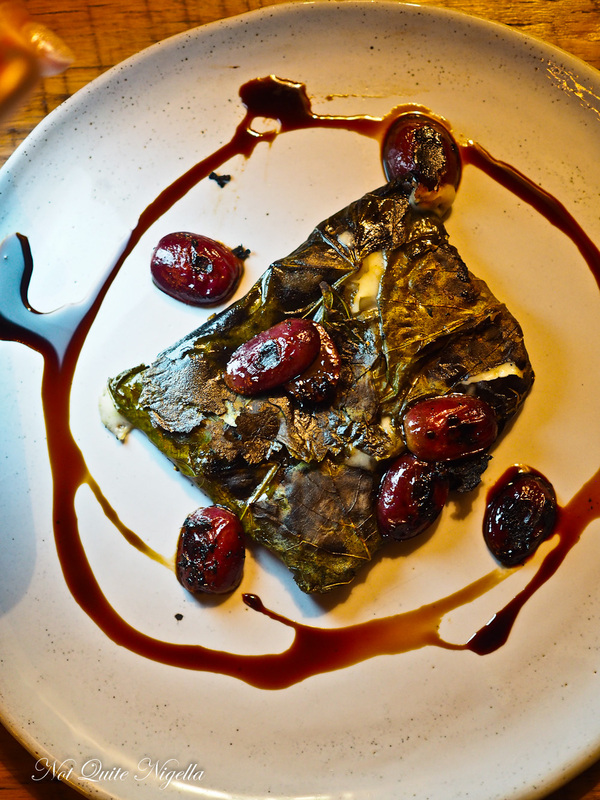 The house specialty are the grape leaves filled with soft, melty Fontina cheese and drizzled with vincotto (cooked wine must). It's sweet and salty at the same time. The San Daniele prosciutto is tissue paper thin and comes from the Friuli-Venezia Giulia region. 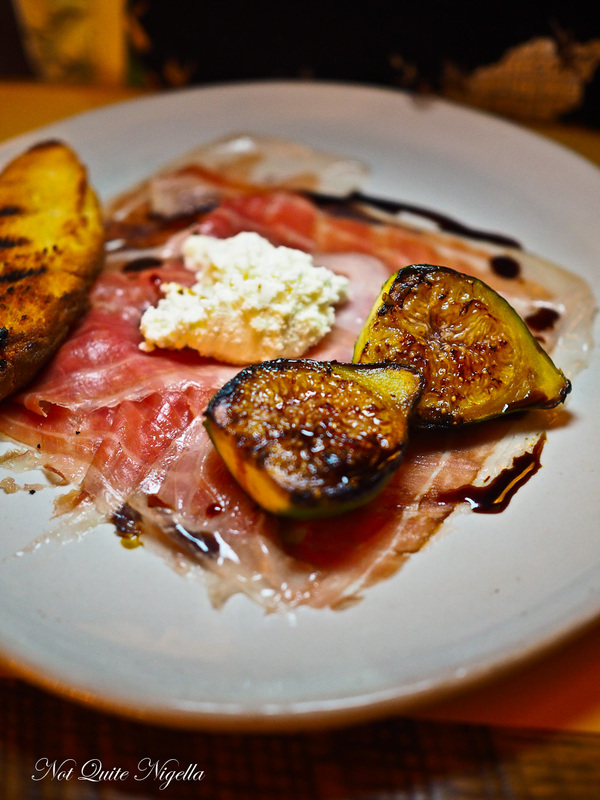 The figs are picked from a 240 year old fig tree and the goat's cheese is soft and creamy. It's a delicious starter. Our poor waitress seems rushed off her feet and we order a couple of pastas. Mr NQN has a Corzetti round pasta. He really enjoys his plate of cozetti-they're round thin discs stamped with different patterns on them if you look closely. 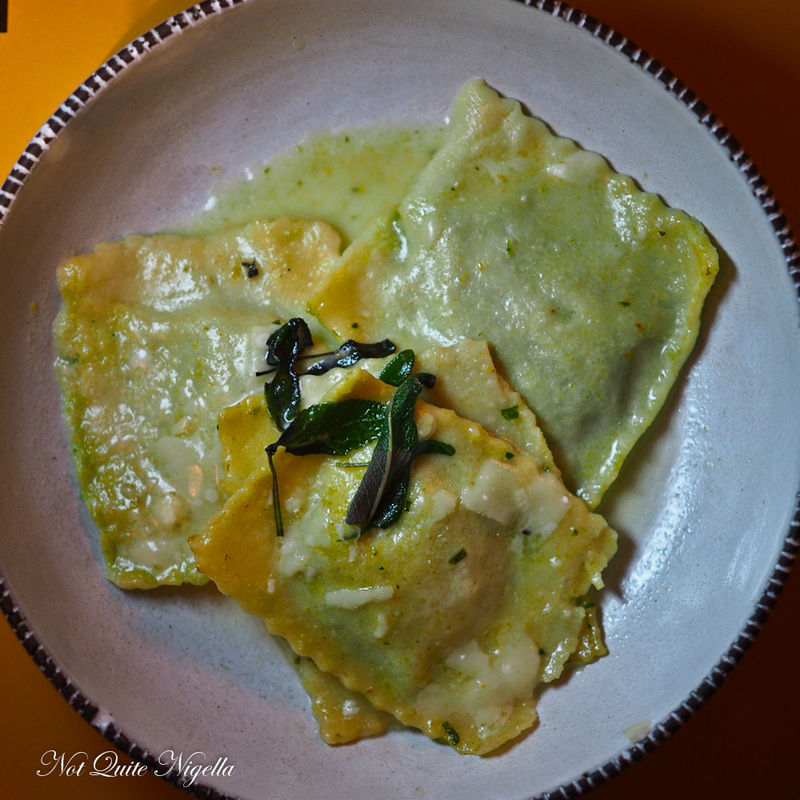 My ravioli is delicious, the fresh herbs singing with flavour. I quickly polish off the four large rectangles. We should have perhaps ordered bread to mop up the sauces too. Dessert is a shared plate of chef Darcoli's grandmother's frittole donuts with dried fruit and grappa served with a mascarpone sauce. He brings it out and then disappears and we thought that we might have had more of a chat as it had quietened down but he didn't seem to want to so maybe he was needed in the kitchen. 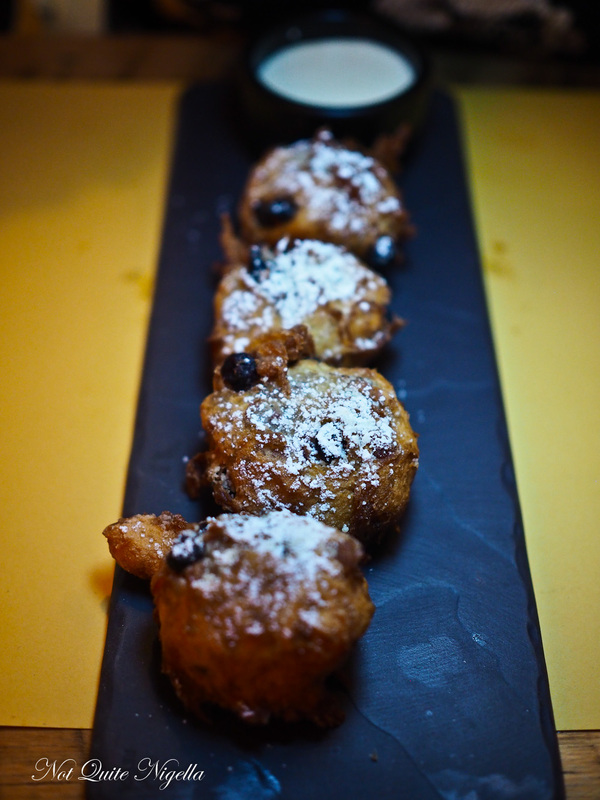 We like the dried fruit pieces in these delicious hot fried donuts and the creamy whipped mascarpone sauce. A little further towards the centre of town on Main Street is Boon Eat and Drink. An orange "B" sign marks its location if you're walking down the street. 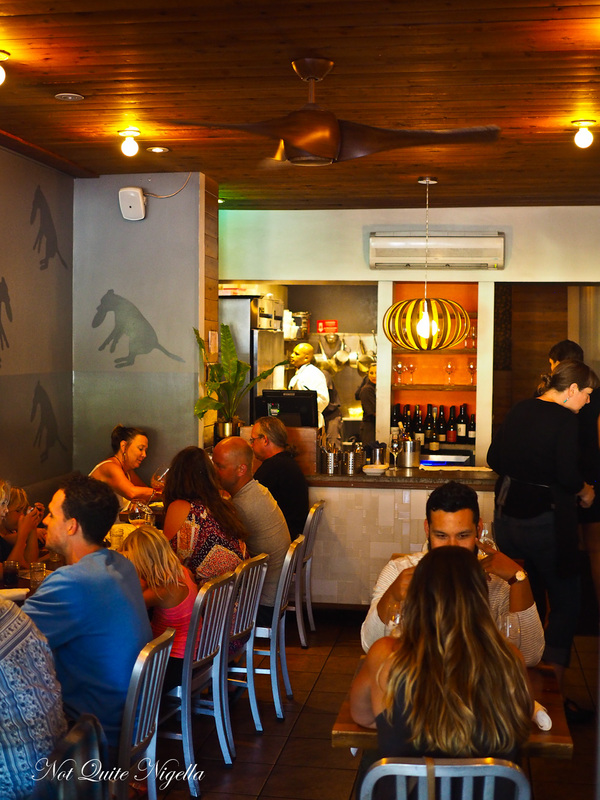 It bills itself as a Modern American Californian restaurant. 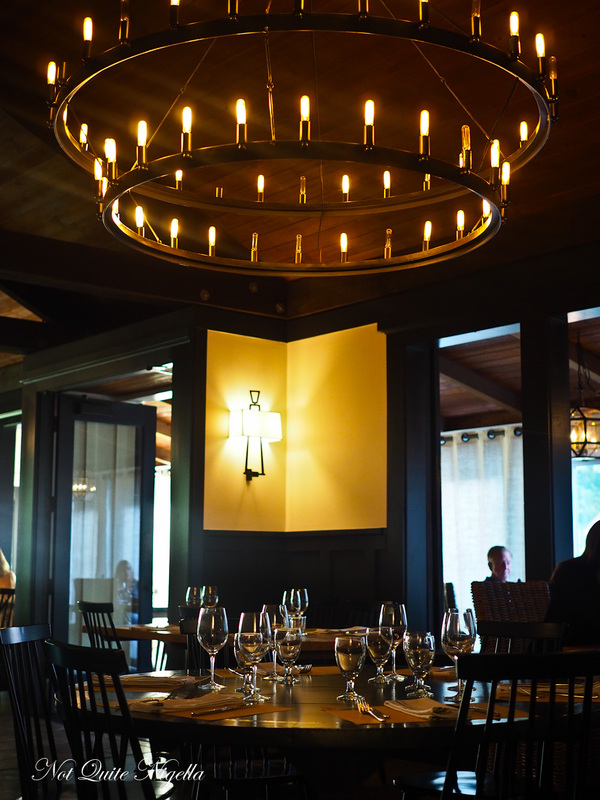 The menu looks largely vegetarian with some meat offerings and chef Crista Luedtke also owns Big Bottom Market, El Barrio bar as well as the Boon Hotel and Spa on Armstrong Woods Road. Service is sweet and friendly and we take a seat although we quickly realise that it is too dark so we ask to move to the outer area which is sunnier with more street atmosphere (although it isn't on the street). We choose a few dishes from the menu to share-the menu is ideal for sharing as we see a lot of people do. 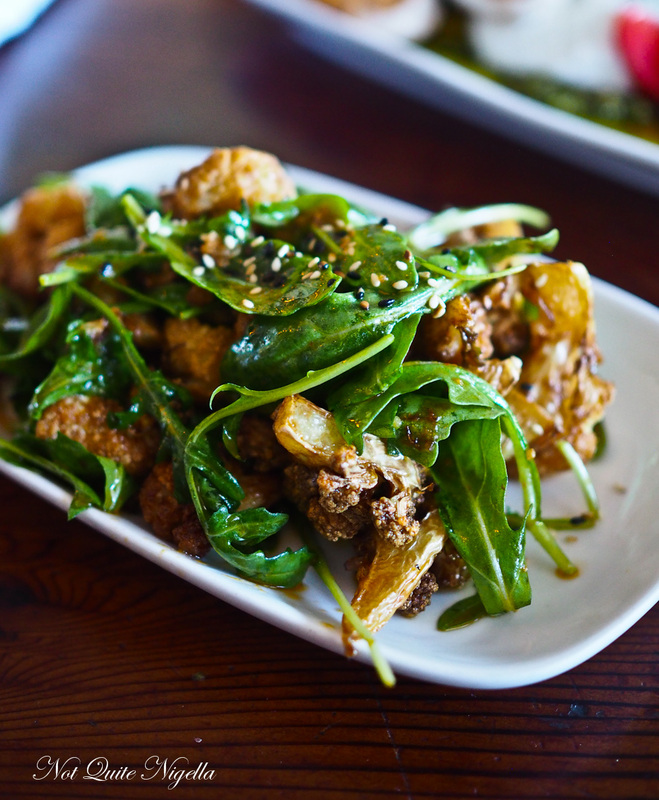 We start with the crispy cauliflower with rocket and a tangy dressing. It's moreish and a good size for sharing too. Burrata is all over the menus in California which suits me just fine because I am too. 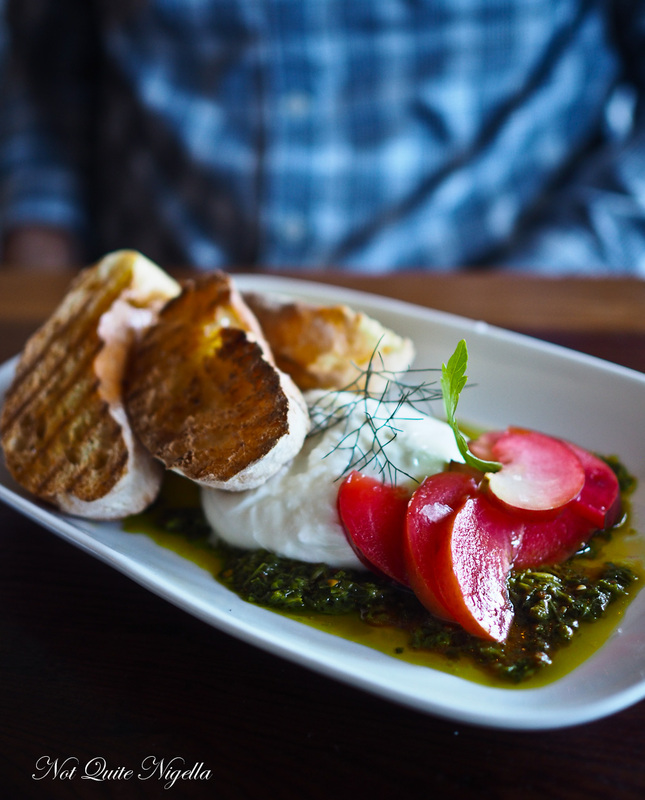 The burrata is beautifully creamy and comes with a tangy pesto that reminds me more of a salsa verde with its lemony garlicky kick and there are sliced pickled plums that impart a mouth puckering tang. These are perfectly matched to the creamy burrata. A popular dish is the polenta lasagna which is like a baked quiche but less eggy. It is made with mixed seasonal veggies and ricotta salata and is served on a bed of garlicky sautéed greens with spicy marinara tomato sauce. It's not layered like a lasagne but it has all the flavours of a lasagna. They were kind enough to give me the recipe for this which I will share on the blog. We decide to share dessert because we are quite full. 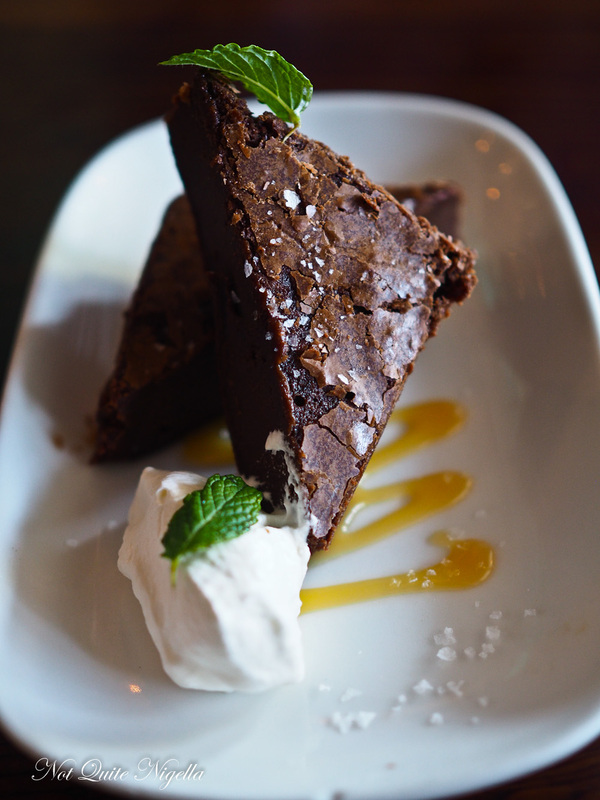 The brownie comes out with salted caramel sauce, whipped cream and sea salt on top. And my oh my, it's a great brownie. Not cake-like at all it is pure, rich gluttony and closer to a rich fudgey ganache than a cake. Heaven. As we drive back the sun is starting to go down casting a golden hue over the Russian River and the vineyards on the left of the road. 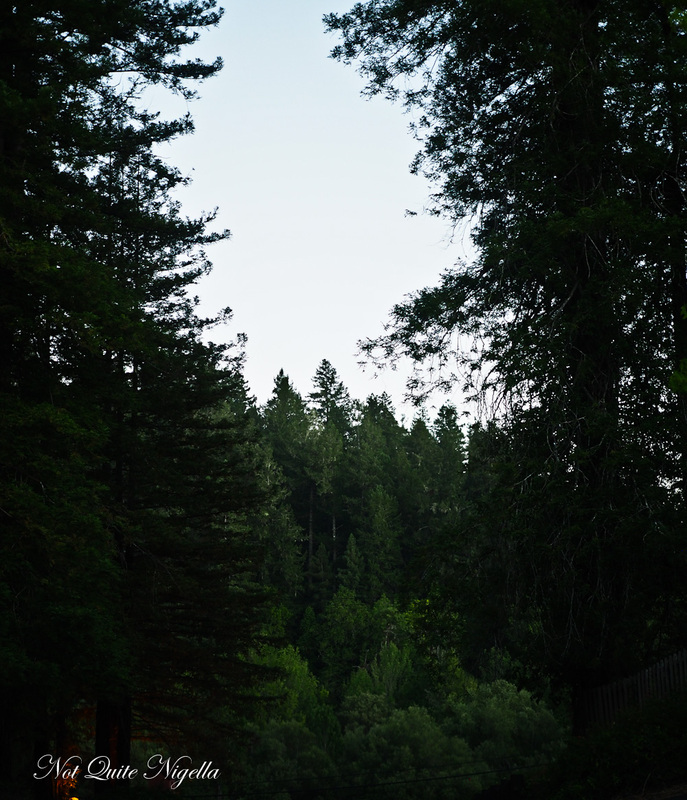 Farmhouses appear tiny in the distance and when we get close they loom large while redwoods shroud narrow passages on the highway. We watch a couple picking blackberries on the side of the road and wish that it wasn't our last night in Sonoma. So tell me Dear Reader, do you enjoy being in the wilderness? Do you enjoy holidaying in more politcally liberal parts of a city or country or is this not a factor? NQN and Mr NQN stayed as guests of Sonoma County Tourism but all opinions remain her own. 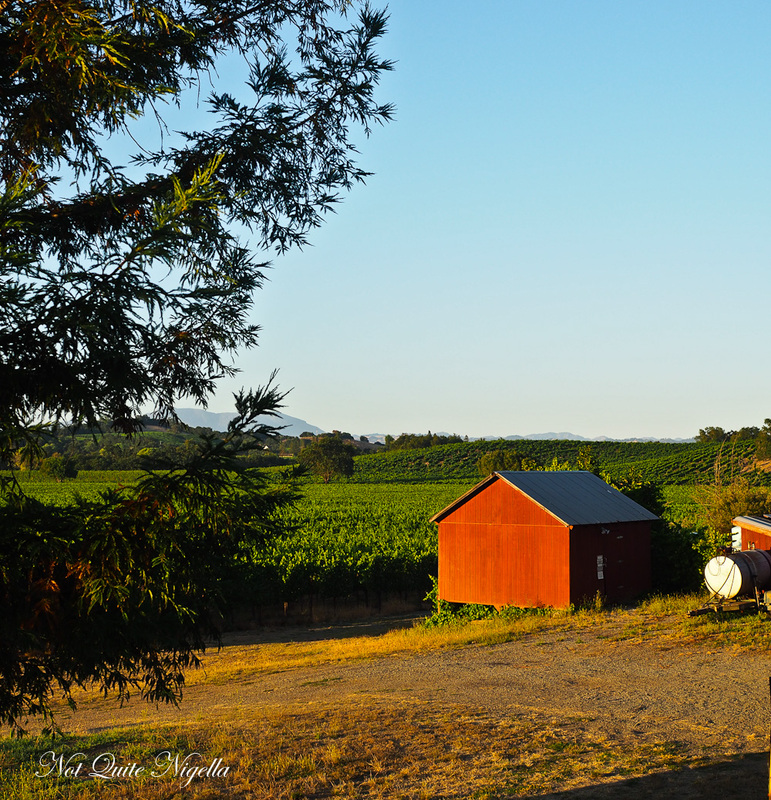 travel3 Personalities and 3 Sonoma County Cellar Door Experiences! travel13 Delicious Things to Eat in San Francisco! 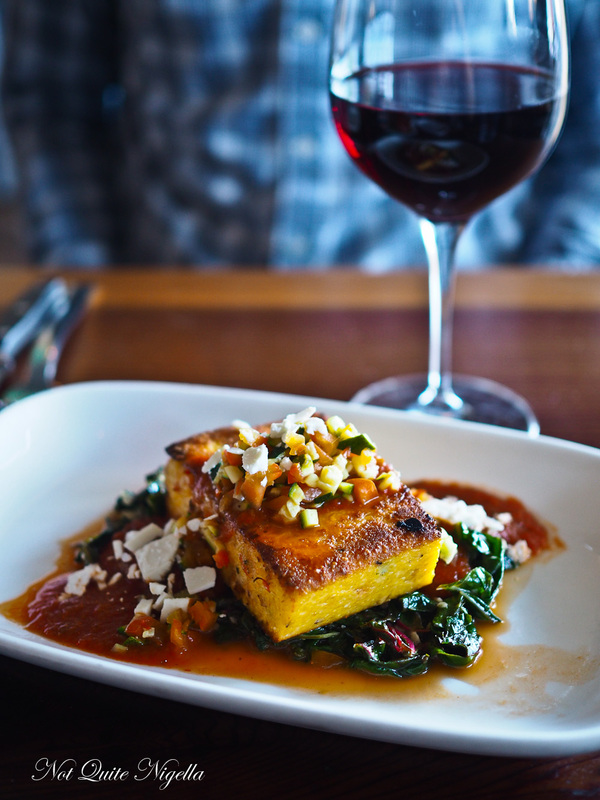 travelBeing Neighbourly: San Francisco Eats by Neighbourhood! 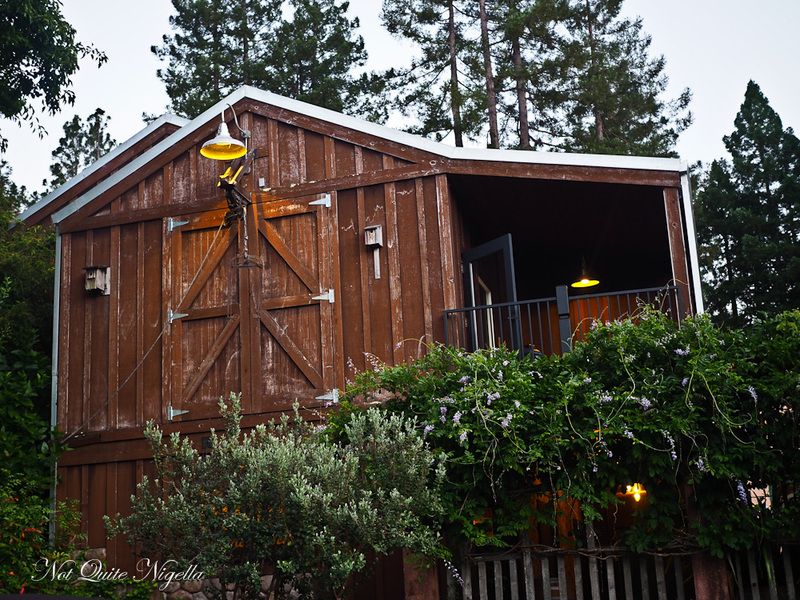 travel 3 Personalities and 3 Sonoma County Cellar Door Experiences! travel 13 Delicious Things to Eat in San Francisco! 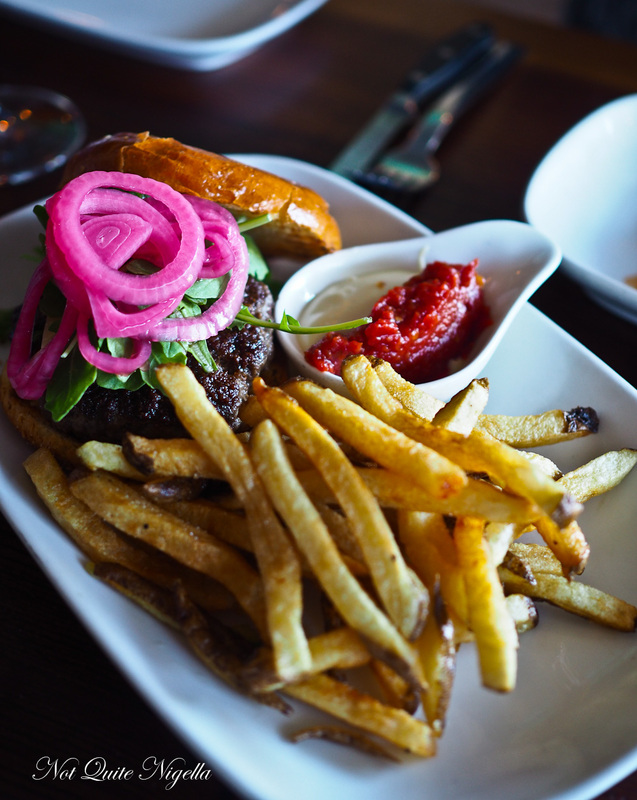 travel Being Neighbourly: San Francisco Eats by Neighbourhood!